Our second live music showcase of 2012 at Brighton’s Quadrophenia-esque Green Door Store, which is tucked into the arches underneath the city’s giant Victorian railway station, featured three of our favourite UK acts Rotifer, Tigercats and Danny Kendall. 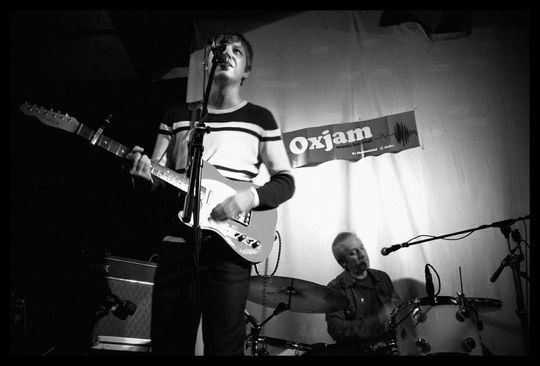 The night was held as part of the Oxjam festival, with all profits from the night being donated to help causes in Africa through Oxfam. First on the stage was Danny Kendall, the pseudonym of part-time Chris T-T and Jim Bob drummer Ben Murray, an act named after the troubled mid-80s Grange Hill character. For this gig his line-up was completed by Jen Macro and Lucy Parnell, two thirds of the band Something Beginning With L . The three piece took to their stools for a quietly beautiful set of acoustic melancholia played on guitar and harmonium. ‘We’ve Never Been To Singapore’ was a high-point in an accomplished set of songs that showcased some lovely three part vocal harmonies and delicate melodies. Tigercats, from east London, are spending much of 2012 touring venues across Spain, the UK and France promoting this year’s debut album Isle of Dogs. What makes them such an interesting act live and on the album is the mix of styles. There’s plenty of upbeat, indie guitar pop in their set, on tracks such as Banned at the Troxy and Full Moon Reggae Party, but it’s never relentless as their repertoire includes more thoughtful moments, perhaps best shown tonight through the tragic ballad Jonny and the sardonic call to arms from lead vocalist Duncan Barrett on Coffin For The Isle of Dogs. Highpoints of tonight’s set included their dream like tour of London and one hit wonders on Vapours, guitarist Stefan Schafer’s intricate guitar playing and the relentless energy of bassist Giles Barrett, who like Duncan was mysteriously barefoot for the performance. Rotifer, the band fronted by Austrian born now Canterbury based songwriter, journalist, broadcaster and festival organiser Robert Rotifer, proved a worthy headliner, as they showcased a number of new songs from their forthcoming 2013 album as well as highlights from last year’s excellent mod-era influenced album The Hosting Couple and The Children of the Hill (2009). What became apparent from their first few bars of opener Aberdeen Marine Lab, from The Hosting Couple, was what an accomplished live trio Robert Rotifer has created. 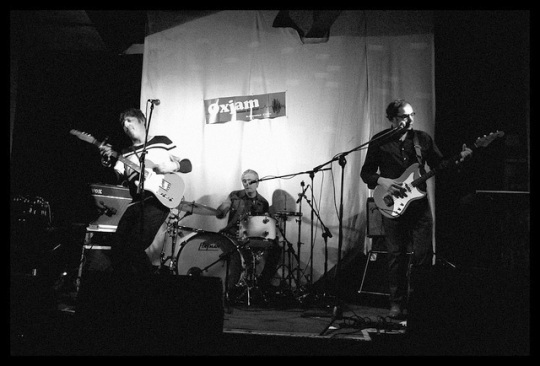 With Death in Vegas’s Ian Button on drums and Television Personalities’ Mike Stone on bass they are seasoned pros who know all the tricks to a successful live set. Robert’s engaging banter about futuristic kitchens and newspaper practices won over those that were unfamiliar with his previous albums. While the raft of new songs: Now On There Is Only Love, By The Time November Comes, Ms Pendantovic Resigns, I Just Couldn’t Eat As Much As I’d Like To Throw Up and set closer Black Bag, proved an enticing glimpse of their forthcoming album for fans such as Tigercats, who later described Rotifer’s set as “furious” on their Facebook page. Final mention goes to Robert Rotifer’s sumptuous guitar sound, played on a Japanese reissue of a custom 1962 Fender Telecaster through a Vox amp. The special ingredient we are told is the use of a EMR valve-driven spring reverb unit made by Button. “Every guitarist should have one,” says Robert proudly. We implore you to check out these three bands, who are not only a fine advert for the vibrancy of the UK music scene but also gave up their time for free for a good cause. Words – Dorian Rogers and Joe Lepper. Pictures – Nic Newman. More of Nic’s pictures from the night can be found on our Flickr page. Forthcoming gigs by the bands. After a break to pen an album of piano ballads, another about lidos and organise an art and musical project about heroes of the space race, Darren Hayman has turned his attention back to his Essex trilogy of albums that started with 2009’s Pram Town and was last seen in 2010 with Essex Arms. While the previous two albums focused on a more modern Essex, of new towns, dogging and its pylon strewn countryside, this final album delves into the county’s violent past of witch finders and civil war. It’s a grim subject matter that Hayman tackles by focusing on the human tales of the lonely, destitute women who were strung up as witches. There’s no Arthur Miller parable about witch trials and McCarthyism here, this is a collection of tales about fear, community and victims. On Elizabeth Clarke for example his protagonist doesn’t deliver a biting political speech about her plight as she prepares to die. Instead she wonders who will feed her dog when she’s gone. She is also concerned about the horrific details of her impending hanging, hoping that someone will come to pull her legs as she dangles from the gallows. This was seen as an act of mercy at the time. This woman is plain scared and rightly so as her death will be horrific. The added sound effects of the rope stretching and swinging in the breeze add to the horror of this track. 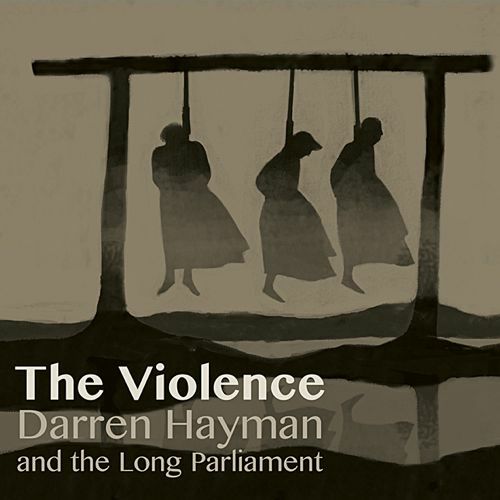 Use of woodwind adds a further melancholy texture and the percussion is perhaps the most striking element of Hayman’s assembled Long Parliament. It shuffles across the songs as if the events are being accompanied by a battle dazed army drummer wandering from the civil war battlefields to the villages and the even greater horror befalling its infirmed old women. Among standout moments are the chilling melody of We Are Not Evil, in with the community led by Witchfinder General Matthew Hopkins justifies its horrific treatment of the 300 women executed in the county between 1644 and 1646 as witches. This melody makes a poignant return later on the album on the track Outsiders, in which the so-called witches plead their innocence. Arthur Wilson’s Reverie is perhaps the most intriguing track and the nearest Hayman finds to a hero amid this slaughter. Focusing on a steward of the Earl of Warwick who protested against the witch trials, Hayman imagines a man who sees beauty and goodness in the women the Essex communities have branded as evil. Here is someone at last who is prepared to pull on the legs of the witches and show them the mercy that was lacking in Essex during this brutal time. It is rare that an album includes a history lesson. It is even rarer that it is delivered so well and marks a fitting but ultimately sad end to this excellent trilogy of Essex life past and present. Bill Fay and John Howard were among the most talented of the crop of early 1970s singer songwriters who were swiftly signed then promptly dumped by the major record labels of the time. It is these two artists, who continue to garner critical acclaim, that are the inspiration for this, at times beautiful, five track EP of piano ballads by Ralegh Long. Long explains that he has deliberately taken a light tough to production, adding “it’s a very naked record. Although the writing is heavily crafted, it was mostly recorded live in single takes.” This gives the listener the chance to really enjoy the lyrics, melody and unashamed sentimentality without the distraction of over production that swept across some of Fay’s 1970s tracks in particular. Opener Elizabeth is the standout track, with pedal steel by ex Hefner man Jack Hayter adding a real warmth to Long’s vulnerable vocals. I’d like to have heard more of Hayter on the EP, but I concede that might detract from the intentionally sparse feel of the EP. The melancholy road trip of love Briganza Street and fragility of Long’s vocals on the title track are among many other high points on an EP that by the final track feels criminally too short. Even though the major labels have long since given up hoovering up piano playing singer-songwriters, there is clearly an appetite for The Gift’s sentimental piano ballad style, with Fay enjoying a revival this year with his excellent latest album Life Is People and Darren Hayman’s 2011 The Ship’s Piano album of ballads also receiving critical acclaim. Those who enjoyed these two albums are certain to enjoy Long’s take on the genre. 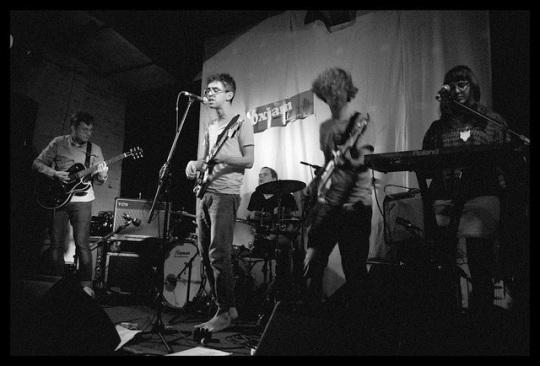 We make no secret of or love for Field Music here at Neon Filler, they topped our album of the year poll in 2010 and have received numerous live reviews on the site since we set it up in 2009. I have no reservations in saying that they are the best band operating out of the UK today and thoroughly deserve their nomination for the Mercury Prize this year. As such it was a great feeling to see them play such a confident set at the Haunt in Brighton last Thursday. The set started with the first three tracks from Plumb, a near perfect sing suite and a brilliant prog-pop opening to the evening. Several songs from Plumb featured in the set, including a brilliant encore of ‘(I Keep ‘Thinking About) A New Thing’, but the evening was notable for how widely they picked from across their career to date. Measure featured strongly, and the tightly wound new-wave funk of ‘Let’s Write A Book’ was just one of the songs played during the evening that deserve to have been bigger hits when released as singles. Another “lost 45” candidate was ‘Rockist’, from the School Of Language side project, a staple in the Field Music set since the end of their short hiatus. 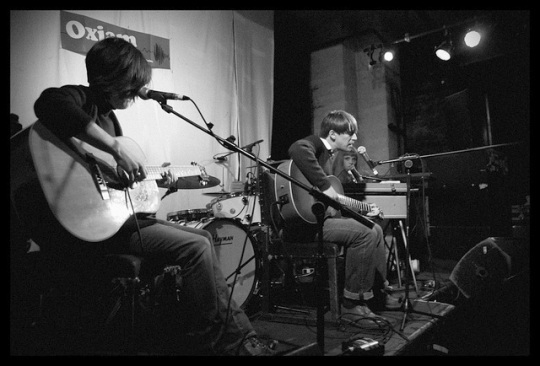 As someone who came to the band via 2006’s Tones Of Town it was ‘In Context’ and ‘A Gap Has Appeared’ has stood out as the two high points in a set that no weak moments. It seems strange to think that these songs are 6 years old, the fresh faced brothers now veterans of the music scene. It was also of note just how much the band has matured and grown as a live act over the past few years, and how strong their sound has become. This was no fey indie show, the guitars crunched and the drums pounded to produce a big sound that carried the songs with a punch. The band state that this tour, with only a sold out Newcastle date remaining, will be their last shows for a while. We can only hope that this means more recording and the Brewis brothers will be back instrument hopping with a set of new songs sometime soon. As music journalists we work to a strict set of standards, setting ourselves above the trappings of the music business as we strive to uncover the truth with honour at every turn. Having said that we’ll pretty much do anything for some chocolate. The PR people at Fire Records have clearly recognised our cocoa based Achilles heel and, in promoting the forthcoming limited edition 7” release of the Lemonheads’ 1989 classic Mallo Cup, have decided to include a couple of real life Mallo Cups – it’s a nice chocolate tea cake kind of thing. As huge Lemonheads fans we’d have probably promoted the single anyway, but the chocolate certainly helps. 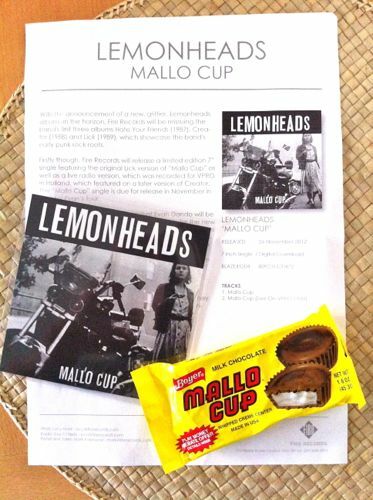 The single is being released on 26 November ahead of a string of reissues by Fire Records of the Lemonheads first three albums: Hate Your Friends (1987), Creator (1988) and the album that first featured Mallo Cup, Lick (1989). All three are reissued early next year. Also in the pipeline is a new Lemonheads album that reunites Evan Dando with the band’s original co-writer Ben Deily. This new release will be produced by Ryan Adams. Also featuring on the single of Mallo Cup is a live radio version of the tack recorded for VPRO in Holland. Of The New Pornographers many talented members Carl Newman’s solo output has arguably been overshadowed by the more complete work of Dan Bejar (aka Destroyer) and Neko Case. Bejar’s Kaputt was a deserved fixture on many 2011 best albums lists and Case, who has delivered a number of sublime near perfect country tinged gems such as Middle Cyclone and Blacklisted during her solo career. Sadly Newman’s two solo albums, also under the name A C Newman, before this year have been tame in comparison. Slow Wonder (2004) had a handful of good tracks, mostly at its powerful start such as Miracle Drug and On the Table, but the production suffered from Newman’s basic drumming arrangements. And while this was addressed on 2009’s Get Guilty, with the hiring of drummer Jon Wurster, the album still had too many fillers. It was also too akin to the New Pornographers weakest album to date the lacklustre Challengers. But finally with his third release Shut Down the Streets, Newman has an album to rival his fellow supergroupers. 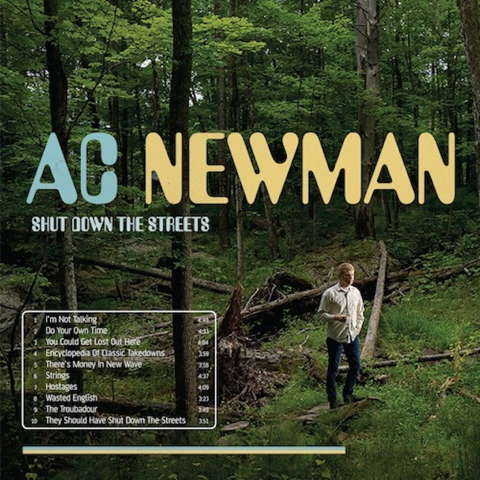 An emotional year for Newman, in which his mother died and his son was born, provided the moving inspiration for an album that ends up being a celebration of life and makes the listener feel good to be alive. A considered approach to production, with deliberate nods to the 1960s such as on Hostages, gives Newman’s pitch perfect vocals the chance to shine. The album does slip a little into dad rock territory at time, which perhaps is not a bad thing for a new dad like Newman. But at least fatherhood appears to have driven out his usual opaque lyrical style for a directness to finally match the punch of his music. Lines such as “we’ve been waiting for you” on Strings about the birth of his son may sound corny, but at least they are to the point. The crowning glory though is his decision to enlist Case for backing vocals duties throughout. Their harmonies are one of the wonders of the modern music world and in the absence of a New Pornographers album this year it’s great to hear them together again. The track Encyclopedia of Classic Takedowns, in particular leaps out as if it were classic New Pornographers thanks to Case. 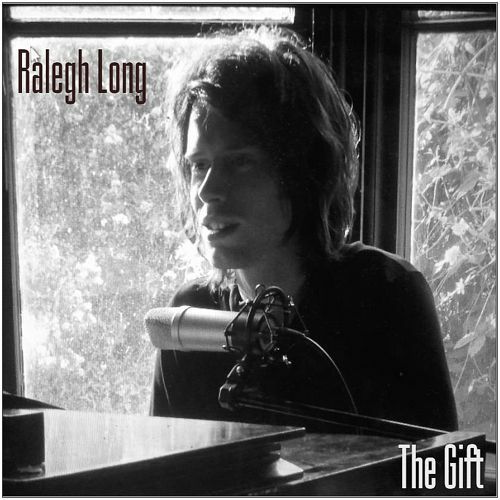 Singer Songwriter Ralegh Long has just released this Jules et Jim inspired video of Elizabeth, the standout track from his latest EP The Gift. We will be reviewing the EP in the next few days and have been left impressed with this Bill Fay and John Howard influenced track in particular, which also features former Hefner man Jack Hayter on peddle steel. The video is directed by Joanna Coates and features Elektra Kotsoni, Daniel Metz, Oscar Rickett. 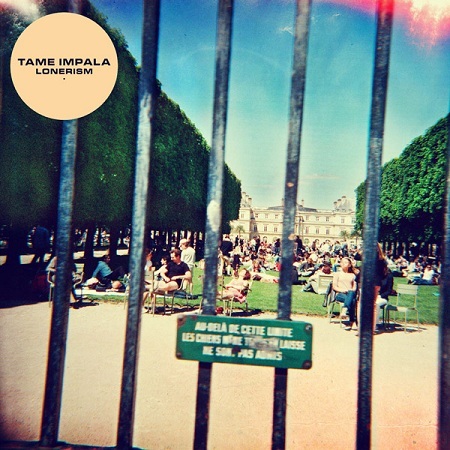 It was no surprise to see MGMT, Mercury Rev and Flaming Lips producer Dave Fridman credited with applying the finishing touches to Tame Impala’s second album of psychedelic pop. Largely recorded by Tame Impala frontman Kevin Parker at home, in hotels, studios and even a plane, Fridman has added that final pop savvy touch, just as he did to the band’s stunning debut Innerspeaker (2010). The end result is something that perfectly blends the care free attitude of a bedroom recording act and the swagger of a seasoned old pro behind the mixing desk. But this is no mere Innerspeaker mark two. Parker and Fridman have added a far more modern touch to the act’s take on late 1960s psychedelia. While early Pink Floyd was arguably the nearest point of comparison for their debut, with Lonerism they now preach at the speakers and lava lamps of far cooler cats like MGMT. To show they are still a little bit out there with the best of the tie dye brigade this Perth, Australia based act have selected Elephant as the album’s lead single. While a fun stomp in the mould of the Glitter band, it is far less accessible than the soulful Apocalypse with its marvellous ascending chords, the guitar riff filled Mind Mischief or the alternative pop gem Feels Like We Only Go Backwards. Innerspeaker really impressed me on its release and two years on I’m still discovering new twists, turns and melodies across its tracks. The fact that Parker and Fridman have actually created a better album speaks volumes for Tame Impala’s deserved and increasing global appeal. After Robert Pollard disbanded Guided By Voices first time around we lost one of the great rock bands. Pollard continued to produce music in a variety of guises, mainly solo and with the Circus Devils, but nothing that fitted into that classic rock band mould. 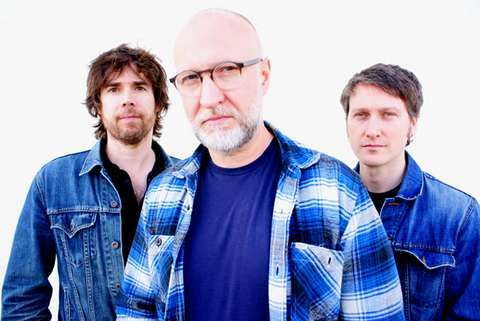 It was therefore an exciting time when he announced the formation of Boston Spaceships, named after his own nick-name for his favourite doughnut, with Chris Slusarenko and Jicks and Decemberists drummer John Moen. Between 2008 and 2011 they released five brilliant albums before suddenly splitting up after the release of 2011’s best album Let It Beard. None of these albums got official UK releases which makes Fire Record’s best of collection, Out Of The Universe By Sundown, more exciting than most greatest hits collections. With a collection of songs by a band it is easy to focus on what isn’t featured, and some of my favourites songs don’t make the cut. I’d have included ‘Chevy Marigold’, ‘Psych Threat’ and half a dozen other tracks on my own collection, but a single CD set of 15 songs isn’t going to have every brilliant track included. What is harder to do is argue against the inclusion of any of the songs that feature here. From the pop brilliance of ‘You Satisfy Me’, from their debut, through to ‘Tourist UFO’ from their swansong (complete with an epic J Mascis guitar solo) their is not one duff track featured. 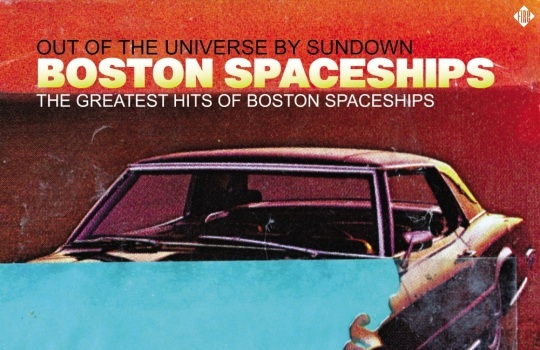 This collection is proof, if proof were needed, that Boston Spaceships were up their with Guided By Voices as one of the great bands of Pollard’s erratic and esoteric career. You only have to look at the guest guitarists that he managed to attract through their career (Chris Funk, Gary Jarman, Peter Buck, Colin Newman, Dave Rick and Steve Wynn among them) to see that this was not one of his throwaway side projects; this was the real deal. Listen to ‘Let It Rest For A Little While’, from Zero To 99, and you’ll hear the best track that Peter Buck played on for most of the decade. The quality of songs here is complimented by the quality of the playing on show, Slusarenko is a hugely talented multi-instrumentalist and John Moen is one of the best drummers around today. Add that to the guests across the albums and some of the best performances of Pollard’s career and you have a pretty classic combination. This album is not one for fans or collectors, there are no demos, live tracks, unreleased songs or b-sides. What you get is a selection of 15 songs from one of the best bands of the 21st century hand picked by Robert Pollard himself. I’m not an entirely impartial voice, I make no secret of how much I love Robert Pollard’s work, but I can tell the difference between his good and bad releases. I’d never encourage anyone to buy the largely awful ‘Superman Was A Rocker’ collection for example. What I can do is unreservedly recommend this album to anyone who wants to hear a set that demonstrates just how good guitar music can be.